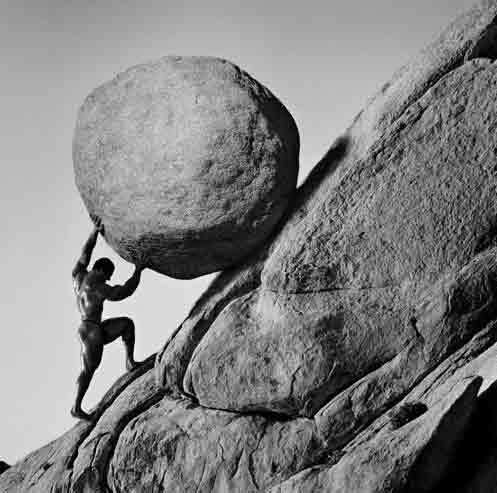 King Sisyphus was punished in Greek mythology for chronic deceitfulness by being compelled to roll an immense boulder up a hill, only to watch it roll back down, and to repeat this action forever (thanks Wikipedia). And this is what our performance tools at work feel like. No sooner have we completed one set of little boxes (SMART objectives, expected outcomes, goals) then another lot is upon us. Now, this would be OK if it were useful. I love to work hard and there is a certain perverse pleasure to be had from a well completed form. But is it of any use at all? Take performance management. We are almost in June and have not yet planned for this year. Admittedly, every day that goes by makes the ‘planning’ get easier. One year I did it in early December and it was a piece of cake. But why is it so late? One reason is that the IT system that is supposed to support the process doesn’t. It is prone to bottlenecks and has a series of people who need to review and click things that means that months can go by without it moving along. The upshot of this is that the focus of energies shifts from having quality conversations to managing this unwieldy system. So, is our performance suffering because of being under- or un-managed? Is there a difference in performance between the people whose performance is perfectly managed and those who haven’t quite filled in a box since 2011? One reason for this is that actually most of our work is unplannable. At least in SMART terms. My job for instance. I know that I edit documents and support the development of project proposals and I know why I do that. But any pretence of estimating how many documents or pages I might edit in a year is just silly. Things crop up. Things change. What I do know at the beginning at the year is the purpose of my work – and surely that is enough. The rest is noise. Managers need incentives to act on performance information, particularly economic incentives. Well, no one ever gets a bonus for being a super manager, nor are there penalties for being not so good. And there are no other incentives really for managing well, beyond intrinsic satisfaction. The disincentives are strong though: rocking the boat, causing bad feeling, making situations worse. Managers need the capacity and autonomy to act on performance information. I think they have the autonomy. But if they have the capacity it is largely down to chance, their character and their previous employer. I don’t believe our managers have any ongoing help and training with recognizing and dealing with good and bad performance. Managers need goal clarity to measure performance information against. We do have clarity about our strategy, vision, where we are heading, but this is talking about a deeper kind of goal clarity: what is the bottom line? In a private organization there is frequently one clear bottom line: money. We have fuzzier goals. Yes, money is important but also goals like social equity. So, all this leaves us where? Am I suggesting no performance management at all? Well no. But there are things we could do differently – a looser kind of planning for example, rather than trying to pull SMART objectives out of a rainbow or the stars. We have job descriptions after all, that say more or less what we are meant to be up to. And more dialogue, more talking throughout the whole year would be a great (unmeasurable) way to actually improve performance. In the meantime, shoulder to that performance management boulder and let’s shove it up the hill one more time. Are you sure we don’t work in the same organisation? This is a really helpful insight into something I am finding troublesome too. ← How are you managing?